The OPPO K1 is now available on the Indian market. This phone may compete with others such as the Redmi Note 7, as it has many specs in common with this device, but also has an in-display fingerprint reader. The K1 is exclusive to Flipkart, which sells it for about US$237. The OPPO K1 has arrived in India. Flipkart has secured the rights to pre-order this phone exclusively in the country. 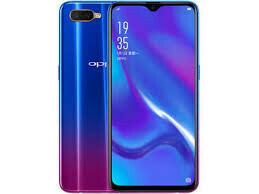 It is priced at 16,990 INR (or US$237) on this site, where customers can choose the black or blue-to-purple gradient versions of this device. The K1 has waded into a market rife with other similar mid-rangers from various rival brands (e.g. the Note 7 from Redmi). However, it has a feature to distinguish it from this competition: an in-display fingerprint scanner. The OEM claims that this component takes only 0.41 seconds for it to unlock a K1 (which, considering the performance of similar modules in other phones, is not in fact that great). Besides this relatively unique point, the device, like the Redmi Note 7, is powered by the Snapdragon 660. It also has the Note 7's waterdrop notch, fitted to a 6.4-inch display with a 19.5:9 aspect ratio and a 91% screen-to-body ratio. The K1 is confined to 4GB RAM SKUs, whereas the Note 7 also has 6GB variants. Nevertheless, the next-gen fingerprint scanner may be a considerable draw over other options such as the new Redmi offering. On the other hand, the K1 runs a version of Color OS based on Android 8.1, which is somewhat disappointing in a new phone. The Redmi alternative, on the other hand, runs the more current Android 9.0-based MIUI 10. With its 48MP main rear camera sensor, the Note 7 may also be a superior prospect for the photo-conscious. The K1 comes a distinct second with its 16+2MP dual rear camera. On the other hand, the OPPO phone's single selfie shooter is a respectable 25MP.